'Videoart at Midnight Edition' will present it's recent issues within the ‘Market Screening’ section of the 59th International Short Film Festival : http://www.kurzfilmtage.de/en/market/screenings/videoart-at-midnight.html. Fabian Reimann, Lukas Hofer, Elise Florenty y Marcel Türkowsky, Cécile Ibarra, Pablo Serret de Ena, Antonio R. Montesinos (Residencias)Francis Hunger, Julian Öffler y Paida Larsen, Eleonore de Montesquiou, Filippo Berta, Adi Matei, Ciprian Muresan, Malgosia Markiewicz, Marco Godoy, Klara Hobza, Patricia Reis, Virgile Novarina y Zaza Bertrand. Exploration de lieux absents/Don’t Forget to Remember, en collaboration avec le groupe de recherche collectif « Art contemporain et cinéma, XXème-XXIème siècle », le 19 avril à 18h30, à l'auditorium de l'INHA. Le deuxième volet des « Visions Anatopiques » proposées par Evgenia Giannouri se déploie sous le signe de l’exploration. Qu’il s’agisse des réminiscences d’une expédition scientifique, de la vision prémonitoire d’une inondation à venir, de la (re)découverte d’une ville fantôme ou des surfaces planes et vides des tabloïds publicitaires détournés de leur rôle communicatif initial, les paysages flottent dans un flux indéterminé de temps et d’espace. Les films rassemblés ici offrent un aperçu de ces territoires, habités ou déjà déserts, en voie de disparition. 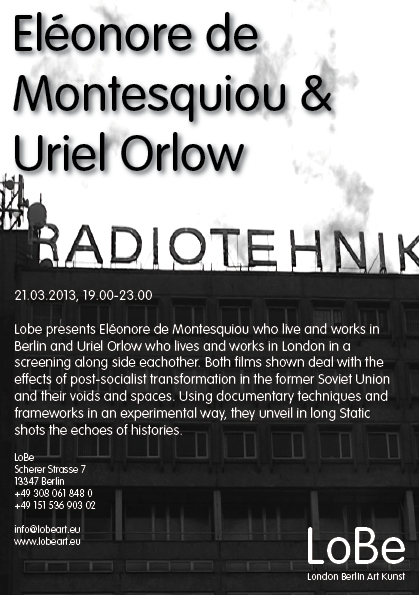 Lobe presents Eleonore de Montesquiou who live and works in Berlin and Uriel Orlow who lives and works in London in a screening along side eachother. 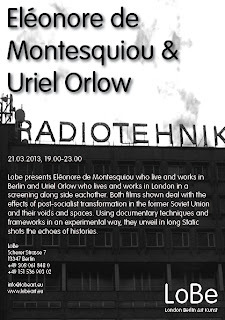 Both films shown deal with the effects of post-socialist transformation in the former Soviet Union and their voids and spaces. Using documentary techniques and frameworks in an experimental way, they unveil in long static shots the echoes of histories. Eléonore traces the history of the radio factory “Radiotehnika” formerly the largest socialist model company for consumer electronics in Riga, which is now abandoned. The starting point for Uriel Orlow is the Armenian town Mush, which was both the scene for the genocide of 1915 against the Armenians, as well a location for housing projects under Mikhail Gorbachev for the earthquake victims of Spitak in 1988 and since the end of the Soviet Union in 1991 a ghost town like. En Autriche, comme partout ailleurs, l’urbain grignote la campagne. Ebenthal, village de Carinthie situé à deux pas de la frontière Slovène, ne comptait que quelques fermes il y a seulement vingt ans. Aujourd’hui, le village est englouti dans les zones commerciales de Klagenfurt. 2006 war kein gutes Jahr für Pluto - mit der Aberkennung seines vollwertigen Planetenstatus stürzte der Himmelskörper aber nicht nur in eine Identitätskrise, sondern sicherte sich gleichzeitig auch einen besonderen Stellenwert in der (Pop-)Kultur. BWPWAP - Back When Pluto Was A Planet - unter diesem Thema versammelt die transmediale in ihrer 26. 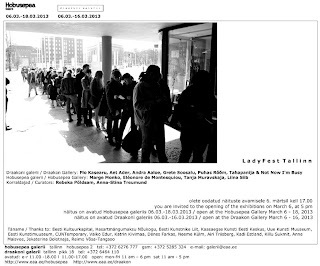 Ausgabe internationale Künstler, Denker und Kulturproduzenten, die in Ausstellungen, Performances, Screenings, Diskussionsrunden und Workshops erkunden, welche neuen Richtungen und Chancen sich aus einer Klassifizierungskrise wie dieser ergeben. 29.01. - 03.02. Like book printing, film has not evolved very much technically: Film today is shot on 35 mm just like in the 19th century. Though it will soon be displaced by digital formats, digital carriers become obsolete unbelievably quickly. This program is a very short history of the disappearance of carrier media. Disque 957is about records, in its time a very modern medium. Ironically, this is intentionally a silent film; music is transferred in a visual rhythm. Color Sequence is the first flicker film in history, and in color at that. The film medium is reduced to its essential: the changing projection of light. This is experienced completely differently in Projection Instructions, a film that “forces” the projectionist to do a live performance. I am Micro is the story of the Indian film industry, told through its abandoned production facilities. In the elaborate animation / … (liquid paper), the filmmaker cuts through books. The protagonist in Gazetteshows us her collected treasures, every issue of the 17 journals she subscribed to in the Soviet Union, archived precisely in neatly bound piles. In China, the woodcut was a popular form of printing to produce simple propaganda material. In contrast, in the animation Some Actions Which Haven't Been Defined Yet in the Revolution the woodcut is used for a very complex visual reflection on the revolution. The External World is a grim psychogram of a cold world, in which the artist consciously applies obsolete, digital animation techniques.